Vietnamese crew members on Hanoi Kilo-class submarine give Prime Minister Nguyen Tan Dung a warm welcome on May 13, 2013. 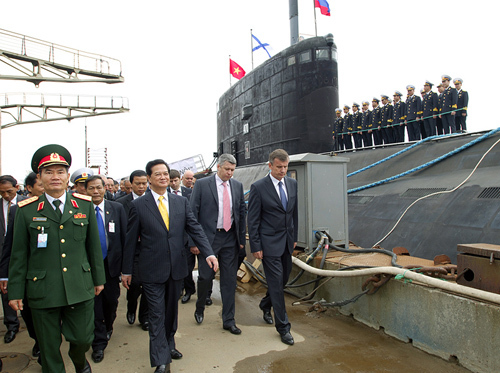 Prime Minister Nguyen Tan Dung on Monday visited Vietnamese crew members on Hanoi submarine, the country’s first Kilo class submarine, docked at the Port of Kaliningrad, Russia while on an official trip to Moscow, according to the government web portal. The submarine, named Hanoi, is the first of six Kilo-class submarines that Vietnam contracted to buy from Russia during Dung’s visit to the country in 2009. According to the contract, the Russian side is also responsible for training sailors and supplying necessary equipment for the submarines. The Kilo-636 submarine was built in Admiralty Verfi Shipyards in St. Petersburg and is being tested near Svetlyi port in Kaliningrad. The submarine, which has successfully experienced 23 test dives, has a displacement of 3,000-3,950 tons, can operate at a maximum depth of 300 metres and at a range of 6,000-7,500 nautical miles for 45 days and nights, and carry a crew of 52. Having the quietest engine in the world, the submarine is the best choice for reconnaissance and patrols. In talking with sailors aboard, the Prime Minister expressed his hope that the crewmembers will promote their proactiveness, activeness and creativeness to overcome all difficulties and rapidly grasp modern military technologies so that they can master the ship after it is transferred to Vietnam, Vietnam News Agency (VNA) reported. Captain Major Nguyen Van Quan, on behalf of the crew, thanked the Party, State and people for their care for the submarine’s crew in particular and the naval force in general. Quan said all the crew men are committed to do their utmost to rapidly acquire the latest military technologies and fulfill their assigned missions, according to VNA. The same day, Dung had a meeting with the press in Kaliningrad , expressing his delight to visit such a peaceful and hospitable city. He affirmed that the Vietnamese people will never forget the support that Russia has given to their country during the past struggle for national independence and unification as well as the current national defence. Dung thanked the Kaliningrad government and people for creating favourable conditions for Vietnamese sailors during their training in the city, VNA reported.